Chow mein (/ˈtʃaʊ ˈmeɪn/) are stir-fried noodles, the name being the romanization of the Taishanese chāu-mèing. The dish is popular throughout the Chinese diaspora and appears on the menus of Chinese restaurants. It is particularly popular in the United States, Britain, Nepal, and India. The word means 'fried noodles', chow meaning 'fried' and mein meaning 'noodles'. The pronunciation chow mein is an English corruption of the Taishanese pronunciation chāu-mèing. The lightly pronounced Taishanese [ŋ], resembling the end of a Portuguese nasal vowel, was taken to be /n/ by English speakers. The Taishan dialect was spoken by migrants to North America from Taishan. In American Chinese cuisine, it is a stir-fried dish consisting of noodles, meat (chicken being most common but pork, beef, shrimp or tofu sometimes being substituted), onions and celery. It is often served as a specific dish at westernized Chinese restaurants. Vegetarian or vegan Chow Mein is also common. Crispy chow mein, also known as Hong Kong style chow mein (see below). The steamed chow mein has a softer texture, while the latter is crisper and drier. Crispy chow mein uses fried, flat noodles, while soft chow mein uses long, rounded noodles. Crispy chow mein has either onions and celery in the finished dish or is served "strained", without any vegetables. Steamed chow mein can have many different kinds of vegetables in the finished dish, most commonly including onions and celery but sometimes carrots, cabbage and mung bean sprouts as well. Crispy chow mein is usually topped with a thick brown sauce, while steamed chow mein is mixed with soy sauce before being served. There is a regional difference in the US between the East and West Coast use of the term "chow mein". On the East Coast, "chow mein" is always the crispy or "Hong Kong style". At some restaurants located in those areas, the crispy chow mein noodles are sometimes deep fried and could be crispy "like the ones in cans" or "fried as crisp as hash browns". At a few East Coast locations, "chow mein" is also served over rice. There, the steamed style using soft noodles is a separate dish called "lo mein". On the West Coast, "chow mein" is always the steamed style; the crispy style is simply called "Hong Kong style" and the term "lo mein" is not widely used. The crispy version of chow mein can also be served in a hamburger-style bun as a chow mein sandwich. There are also variations on how either one of the two main types of chow mein can be prepared as a dish. 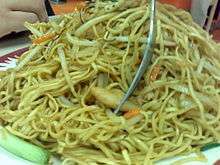 When ordering "chow mein" in some restaurants in Chicago, a diner might receive "chop suey poured over crunchy fried noodles". In Philadelphia, Americanized chow mein tends to be similar to chop suey but has crispy fried noodles on the side and includes lots of celery and bean sprouts and is sometimes accompanied with fried rice. Jeremy Iggers of the Star Tribune describes Minnesota-style chow mein as "a green slurry of celery and ground pork topped with ribbons of gray processed chicken". Bay Area journalist William Wong made a similar comment about what is sold as chow mein in places like Minnesota. A published recipe for Minnesota-style chow mein includes generous portions of celery and bean sprouts. Another Minnesotan variant includes ground beef and cream of mushroom soup. Food historians and cultural anthropologists have noted that chow mein and other dishes served in Chinese American restaurants located away from areas without any significant Asian American population tend to be very different from what is served in China and are heavily modified to fit the taste preference of the local dominant population. As an example, the chow mein gravy favored in the Fall River area more closely resembles that used in local New England cooking than that used in traditional Chinese cooking. The founder of the food manufacturer Chun King and the creator of canned chow mein admits of using Italian spices to make his product more acceptable to Americans whose ancestors came from Europe. Chow mein is mentioned as early as 1920, in the novel Main Street by Sinclair Lewis. It is frequently confused with chop suey; a dish incorrectly labeled as chow mein was sometimes served in American restaurants, drug store soda fountains, school cafeterias, senior citizens facilities, and military bases chow halls. In many of these cases, this particular dish was served over rice and did not include noodles. In 1946, one of the first companies to market "chow mein" in a can was Chun King. The product's creator was Jeno Paulucci, the son of Italian immigrants, who developed a recipe based mostly upon Italian spices that would be better catered to the food preferences of European immigrants and some Americans of similar ethnic origins. To keep cost down, Paulucci ingeniously substituted expensive water chestnuts with lower cost celery stalks that were originally destined for cattle feed. Paulucci's company became so successful selling canned chow mein and chop suey that President Gerald Ford quipped “What could be more American than a business built on a good Italian recipe for chop suey?" when praising Paulucci accomplishments with Chun King. After Paulucci sold Chun King in 1966, the company would be sold several more times more until it was dissolved in 1995. By 1960, Paulucci described in the New York Times that "At Chun King we have turned out a 'stew-type' chow mein. I'd guess this type has been around for thirty - maybe forty - years. To make it, all the meat, seasonings and vegetables are dumped into a kettle and stewed for hours - until everything is cooked." At the time of the interview, "sales from restaurants 'to take home' are almost three times as great as in the food markets". Paulucci wanted to increase market share by using more effective advertising. Chow mein was brought to Brazil by Japanese immigrants and is thus referred as yakisoba (Portuguese pronunciation: [jakiˈsoβɐ] or [jakisoˈba]). It fits Brazilian tastes rather than Japanese ones though, and is thus more similar to the North American versions of chow mein. Pastelarias and Asian restaurants serve it in the entire country. They generally are presented in chicken (the most common), beef, shrimp and pork versions, with vegetarian and egg versions being much rarer. Brazilian yakisoba is typically served much more al dente than the Japanese, being also heavy in soy sauce, sesame oil, and vegetables, almost always including at least carrot, cabbage, onion and at least one dark green species (usually other than kale, collard, spinach, chicory or mustard) such as Chinese cabbage, and less often either bean sprouts, broccoli/broccolini, zucchini, shiitake, bell pepper and/or cucumber. Also popular is yakibifum ([jakibiˈfũ], from Japanese yakibīfun), its equivalent that instead of a wheat noodles uses rice vermicelli. Brazilian spring rolls' (rolinhos-primavera or harumakis) fillings generally use the same ingredients of the stir-fried noodles in the restaurants or fast-food chains they are found, though spring rolls may have cheese, usually white (such as catupiry or other kinds of requeijão, or queijo minas), or tofu instead of meat, what is uncommon for the noodles. All of them, but most often and especially spring rolls, may be served with bright red molho agridoce (soursweet sauce), that combines ketchup, vinegar, sugar, star anise and other spices. Canadian westernized Chinese restaurants may offer up to three different types of chow mein, none of which is identical to either of the two types of American chow mein. Cantonese style chow mein contains deep-fried crunchy golden egg noodles, green peppers, pea pods, bok choy, bamboo shoots, water chestnuts, shrimp, Chinese roast pork (char siu), chicken, and beef, and is served in a thick sauce. Plain chow mein is similar to other Western chow meins but contains far more mung bean sprouts; some regional recipes may substitute bean sprouts for noodles completely. In Canada, Hong Kong style chow mein is similar to plain chow mein but is always served on a bed of deep-fried crunchy golden egg noodles. The Japanese Canadian community also have their own version of chow mein that might include dried seaweed and pickle ginger and could be served in a bun. Chow mein is also common in Indian Chinese, Bangladeshi Chinese, and Pakistani Chinese cuisine. In India, it was introduced by the Chinese of Calcutta. It is usually offered Hakka or with gravy. Catering to vegetarian diets, there is an Indian variant, vegetable chow mein, which consists of noodles with cabbage, bamboo shoots, pea pods, green peppers, and carrots. In the New Delhi area, chow mein can sometimes include paneer with the mixture of noodles and vegetables. Another non-meat Indian variant includes scrambled egg as a protein source. Kolkata has its own variant that is called Calcutta Chow Mein or Calcutta Chowmin that also includes green chilli, chilli garlic, or hot garlic. Tibetans who settled in Nepal brought chow mein with them. It is a popular fast food in Nepal. The Newari people of the Kathmandu Valley use water buffalo meat and chicken in their cuisine, and chow mein in Nepal is often cooked with onion, vegetables and buff (water buffalo meat). Many West Indian people include chow mein in their cuisine, especially peoples from islands like Trinidad and Tobago and Jamaica which include a significant ethnic Chinese population; much of the cooking has infused itself into the population in general. As well, in the South American country Guyana the culture and cuisine is similar to the Caribbean's. These chow mein dishes are cooked in a similar manner, with green beans, carrots, peas, onions and sometimes other vegetables. Meat used is mostly chicken and sometimes pork and/or shrimp. The main difference is that local spices are added, and the dish is often served with hot Scotch bonnet peppers and/or pepper sauce. In Cuba, aside from the foreign owned tourist hotels which often serve Western-style Chinese food, local Chinese restaurants can be found in Havana that offer a distinct Cuban style. In Panama, chow mein is prepared with a mixture of shredded carrots and cabbage with pork or chicken and served over noodles. Another recipe includes canned corn. Chinese food (Chifa) is very popular in Peru and is now a part of mainstream Peruvian culture. Chow mein is known to Peruvians as Tallarín salteado and may contain peppers, onions, green onions, and tomatoes. Traditional chow mein is made with egg noodles which are boiled then strained and left to dry. They are then stir fried and finally left to sit at the bottom of the wok and pressed down, this crisps the noodles at the edges and underside. Chow mein is made with either seafood, often just prawns, chicken, beef or barbecued pork. Restaurants will serve a combination chow mein or a single type. Chicken and beef are often softened with a little bicarb of soda. The sauce is made from garlic, rice wine, light stock, MSG, salt and corn flour. Vegetables are usually one green such as bok choy or choy sum plus a little chopped carrot, but also other green vegetables are acceptable. This stir fry is poured onto the noodles. Chow mein is unique as its noodles are both soft in part but also crispy. ↑ Hsiung, Deh-Ta & Simonds, Nina (2005). Food of China. Murdoch Books. p. 239. ↑ Cho, Lily (2010). Eating Chinese. University of Toronto Press. p. 51. ↑ Aggarwal, Uma (2013). America's Favorite Recipes. iUniverse. p. 199. ↑ Mason, Laura (2004). Food Culture in Great Britain. Greenwood Publishing Group. p. 163. ↑ Bindloss, Joseph (2010). Nepal: Country Guide Series, Lonely Planet guidebooks. Lonely Planet. p. 65. ISBN 9781742203614. ↑ Ahuja, Aashna (2015-11-27). "Indian Chinese Cuisine: India's Love Affair with Chinese Food". NDTV. 1 2 "Chow mein noodles, fried". GourmetSleuth. Retrieved 2015-06-16. 1 2 3 "The pounds – of noodles – pile up at chow mein factory". Made In Fall River. 2008-09-23. Archived from the original on 2013-12-06. Retrieved 2010-09-12. ↑ Etter, Gerald (1988-11-09). "Classic Cantonese Chow Mein With Fried Noodles – That Was Then. Sophistication, Freshness And Delicacy – This Is Now". Philadelphia Inquirer. ↑ Kilgannon, Corey (1997-11-23). "In Search of Chow Mein". New York Times. ↑ Hansen, Barbara (2000-04-19). "Chow Mein Lives". Los Angeles Times. ↑ Jacobson, Max (1999-04-15). "Soup That Bowls You Over: One man's quest for the perfect won ton min (in America, anyway) ends at Har Lam Kee". Los Angeles Times. ↑ Ferretti, Fred (1983-04-13). "Chinese Dishes, American Style". New York Times. ↑ Eng, Monica (2005-11-03). "Theories on origin of other Chinese foods". Chicago Tribune. 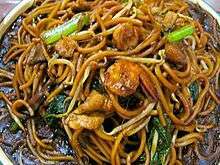 ↑ "Top Spots For Chow Mein In The Region". CBS Philly. 2013-09-10. ↑ Iggers, Jeremy (1999-10-27). "Restaurant review: Chow mein". Minneapolis Star Tribune. ↑ Wong, William (2010). Yellow Journalist: Dispatches from Asian America. Temple University Press. pp. 92–94. Note: The essay in this book was original published in the July 21, 1988 issue of the East-West News as an article titled "Minnesota Chow Mein". ↑ "Nankin-Style Subgum Chow Mein". Washington Post. 2007-05-23. ↑ Grobe, Crystal (2012-10-09). "Bite Of Minnesota: Subgum Chow Mein". WCCO-TV. ↑ "Recipes: Beef Chow Mein Hot Dish". Minneapolis Star Tribune. 2007-01-17. ↑ Lim, Imogene L. & Eng-Wong, John (1994). "Chow Mein Sandwiches: Chinese American Entrepreneurship in Rhode Island" (PDF). In Kwok, Munson A. & Quan, Ella Yee. Origins and Destinations: 41 Essays on Chinese America. Los Angeles: Chinese Historical Society of Southern California, UCLA Asian American Studies Center. pp. 417–436. ISBN 9780930377038. OCLC 260218520. ↑ Lim, Imogene (Spring 2006). "Mostly Mississippi: Chinese Cuisine Made In America". Flavor & Fortune. 13 (1). pp. 11–12. 1 2 3 Shapiro, T. Rees (2011-11-30). "Jeno Paulucci, pioneer of frozen-food business, dies at 93". Washington Post. ↑ Lewis, Sinclair (1920). Main Street. P. F. Collier and Son Corporation. Retrieved 2015-06-16 – via Google Books. ↑ Lewis, Sinclair (1920). Main Street – via Project Gutenberg. 1 2 "Fountain Specials for the Peoples Drug Store ad". Free Lance-Star. 1982-04-08. p. 10. 1 2 "School lunch menus". South Coast Today. 1996-10-20. 1 2 Shriver, Waneta (2004-06-03). "Ruthton News". Tyler Tribune. ↑ Index of Recipes: Armed Forces Recipe Service; 2003 Index; COG I Stock No. 0530-LP-011-3090 (PDF). Armed Forces Recipe Service. United States Government. 2003. ↑ Key, Janet (1989-06-22). "RJR Sending Chun King To Orient". Chicago Tribune. 1 2 Gorman, John (1987-03-23). "Food Giant's Green Thumb Grew 2 Big Successes". Chicago Tribune. ↑ Slotnik, Daniel E. (2011-11-25). "Jeno Paulucci, a Pioneer of Ready-Made Ethnic Foods, Dies at 93". New York Times. ↑ Witt, Linda (1976-09-13). "What Makes Jeno Paulucci Happy? Italian Influence, Clean Lakes, Punctuality and Pizza Eaters". People. 6 (11). p. 72. ↑ Ford, Gerald R. (1976-09-16). "Remarks of The President at the Italian-American Foundation Bicentennial Tribute Dinner" (PDF). White House – via Gerald R. Ford Presidential Library. ↑ McQuaid, Kevin L. (1995-04-04). "Chun King Corp. to close plant, eliminate 173 jobs". Baltimore Sun. Retrieved 2015-06-16. ↑ Alden, Robert (1960-03-13). "Advertising: Chow Mein to Be Reoriented: Packager Cooks Up Sales Recipe for 'Chinese' Dish". New York Times. p. F12. (subscription required (help)). Alternate Link via ProQuest. ↑ Sakauye, Russell (2013-05-29). "The Legacy of the Cumberland Chow Mein". The Bulletin (JCCA). Japanese Canadian Citizens Association. ↑ Bain, Jennifer (2011-03-08). "Japanese-Canadian chow mein: Chow mein — with seaweed and pickled ginger — never tasted so good". Toronto Star. 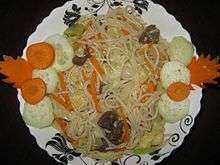 ↑ "Recipe: Egg Chowmein". Zee News. 2013-01-21. ↑ Shaw, Kanchan (2010-03-17). "Egg Hakka Chowmein". Gourmet India. ↑ Bhattacharya, Chandrima S. (June 21, 2015). "Long live chow mein: Hakka or gravy, Dacres Lane or Tangra, Chandrima S. Bhattacharya traces the journey of the ubiquitous Calcutta chowmin". Calcutta Telegraph. ↑ Ganeshram, Ramin (2011-02-01). "Recipe: Eight-Treasure Trini Chow Mein". NPR. ↑ Ganeshram, Ramin (2011-02-02). "Chinese New Year, Trinidad-Style". NPR. ↑ Nelson, Cynthia (2013-01-29). "Guyanese-style chicken chowmein": Sometimes you just crave chowmein. Using chowmein noodles, marinaded chicken, and veggies like beans, carrots, and green onion, you can make your own version at home". Christian Science Monitor. ↑ Seponara-Sills, Jonny & Seponara-Sills, Amy (2011-04-30). "Guyanese chow mein: A traditional Guyanese dish that reveals a fusion of Asian influences". Christian Science Monitor. ↑ Montenegro, Nayla (2007-03-30). "El "Chow Mein" es panameño" [The "Chow Mein" is Panama]. Panamá América (in Spanish). ↑ "Lunch Bunch: A Peruvian twist; Andes fare meets Mexican eatery". Times Record News. 2012-07-06. Wikimedia Commons has media related to Chow mein.